John Updike has died at the age of 76. Updike's richly imagined novels chronicle the loves and losses of a post-Depression generation growing up during and away from the horrors of World War II into the uncertainty and the promise of the late 20th Century. Updike's second love was painting. Hillel Italie writes for AP that after graduating from Harvard, John Updike accepted "a one-year fellowship to study painting at the Ruskin School of Drawing and Fine Arts at Oxford University. During his stay in England, a literary idol, E.B. White, offered him a position at The New Yorker, where he served briefly as foreign books reviewer. Many of Updike's reviews and short stories were published in The New Yorker, often edited by White's stepson, Roger Angell." Updike did not pursue the visual arts as a profession but he wrote intelligently and personally about painting in particular. George Waldman wrote in the New Statesman that Updike was " a gentle critic, whose infatuation with the appearance of things makes him sympathetically attentive to everything he sees. 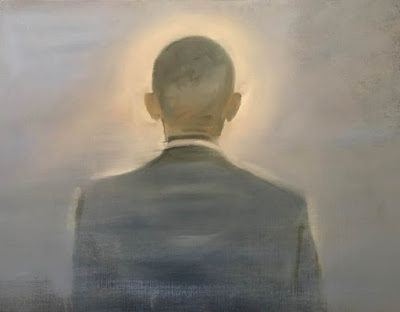 He is also a patriot, whose writings on American art are character-ised not so much by defensiveness - there is often no need for it - as by a genially stubborn resolve to ensure that his country's artists are given their due." 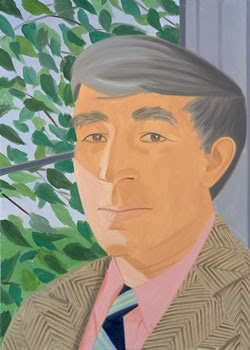 Last May, John Updike gave a lecture entitled "What is American About American Art" at the Jefferson Lecture in the Humanities in Washington DC. Updike spoke at length about Picturing America, a series of reproductions of American paintings that will be given to schoolrooms across the country. 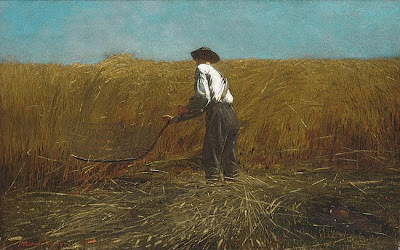 Updike viewed Winslow Homer's The Veteran in a New Field, painted in 1865, as a celebration of "the widespread return of Civil War armies from the fields of battle as a triumph of a democratic society.” Homer's image could speak for the scores of American troops who will return to civilian life in the next few years as our current armies begin their long return from Iraq. Updike's collections of art writing - Just Looking and Still Looking are written more from a fan's viewpoint than a critics and are quite rewarding because of this unique viewpoint. Updike's novel Seek My Face concerns a fictional American postwar painter. Random House explains that the novel " takes place in one day, a day that contains much conversation and some rain. The seventy-eight-year-old painter Hope Chafetz, who in the course of her eventful life has been Hope Ouderkirk, Hope McCoy, and Hope Holloway, answers questions put to her by a New York interviewer named Kathryn, and recapitulates, through the story of her own career, the triumphant, poignant saga of postwar American art. In the evolving relation between the two women, the interviewer and interviewee move in and out of the roles of daughter and mother, therapist and patient, predator and prey, supplicant and idol. The scene is central Vermont; the time is the early spring of 2001." 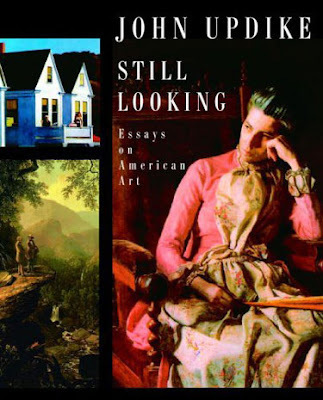 The writing in Seek My Face is lyrical and the story is a rich rumination on American art. I am working on a new painting in my ongoing body of work which deals with the hopes and dreams of 21st century American society as viewed through our post World War II history. 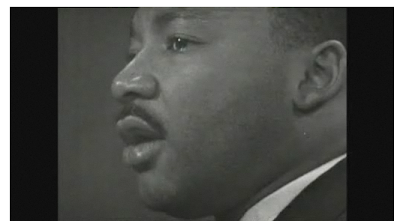 I was a young boy when Martin Luther King Jr, was killed in April 1968 and so I missed the power and beauty of his oratory and the hope embodied in his presence. In this new painting, inspired by photos of MLK at the Lincoln Memorial in August 1963 while giving his "I Have A Dream" speech, I continue my series of portraits of figures of great honor. In this group of paintings, the power of memory is evoked to provide clues to the future. 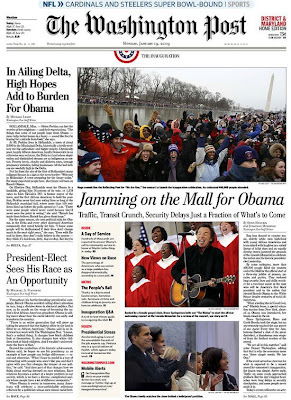 Arcade Fire plays an appropriate cover song at the Obama Staff Ball on January 20, 2009. Note to the videographer - try not to sing along on the chorus next time. Though I have been guilty of this myself on more than one occasion. "Born in the USA" indeed. 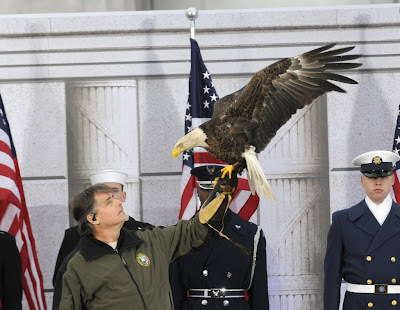 Video of the performance of John Williams' latest work, Air and Simple Gifts, from the Inaugural Ceremony of President Barack Obama. Yo-Yo Ma on cello, Itzhak Perlman on violin, Gabriela Montero on piano, and Anthony McGill on clarinet. Watch "We Are One" Now Online at HBO.com. 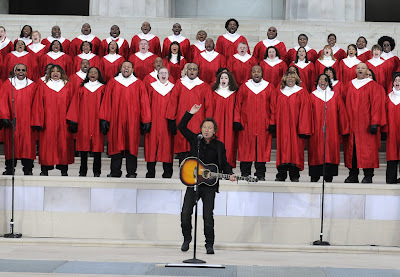 If you missed yesterday's (January 18, 2009) "We Are One" Concert for Obama at the Lincoln Memorial, you can watch it now onlline at "We Are One" on HBO.com. King: The Dream is Real Today! The Dream is Real Today! 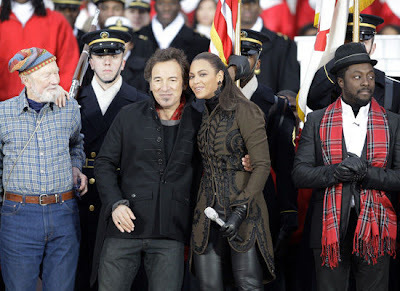 Images from the Presidential Inaugural Committee's Photostream of "We Are One"
Jon Bon Jovi and Bettye LaVette perform "A Change Is Gonna Come"
Herbie Hancock, Will.I.AM, Sheryl Crow - One Love, Where Is The Love? 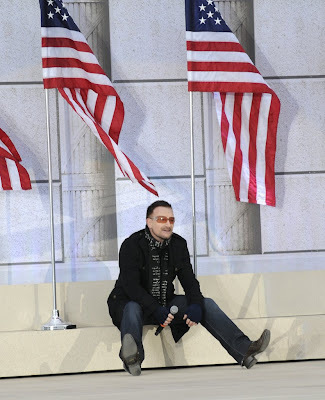 Today several big names and recognizable faces from the entertainment world endured the cold for a rehearsal of tomorrow’s Opening Ceremony at the Lincoln Memorial. President-elect Barack Obama, with the help of an all-star line-up, will kick off the inaugural celebration there at 2:30 p.m. tomorrow. The event is free and open to the public. If you plan on attending the event tomorrow, we’ve put together some helpful information that you should check out. After the event, submit your photos to our online photo gallery - they could even make it into in the Official Inaugural Book. For the first time ever, the Official Inaugural Book will be peppered with photos from ordinary Americans, in addition to the work of award-winning professional photographers. If you can’t make it to Washington D.C. tomorrow, you can watch the show live on HBO at 2:30 p.m. (non-subscribers can watch for free) or on HBO.com. HBO will also be presenting an encore performance from 7:00 - 9:00 p.m. ET/PT. United States Coast Guard video footage captured by surveillance cameras of the emergency landing of US Airways Flight 1549 in the Hudson River. Watch for yourself as Chesley Sullenberger, known as "Sully," successfully lands the plane without any major injuries. 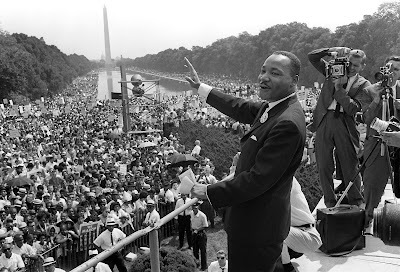 Martin Luther King Jr. on the steps of the Lincoln Memorial in Washington, DC on August 28, 1963, the day he gave the “I Have a Dream” address. A national holiday honors King next Monday. The Los Angeles Times is reporting that, "A slew of A-list talent has signed on to kick off next week’s presidential inauguration festivities. 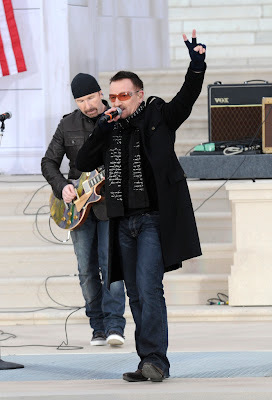 The official organizing committee announced today that “We Are One: The Obama Inaugural Celebration at the Lincoln Memorial,” which will air Sunday on HBO, will feature performances from of Beyonce, Mary J. Blige, Bono,, Sheryl Crow, Josh Groban, Bruce Springsteen, James Taylor, will.i.am and Stevie Wonder." "Jamie Foxx, Martin Luther King III, Queen Latifah and Denzel Washington will read historical passages at the two-hour free event. HBO will televise the celebration at 7 p.m. on an open signal, so it will be accessible to anyone with cable or satellite television." "This is a great opportunity to capture an historic event in a very meaningful setting," said producer and director Don Mischer, whose past credits include the Olympic ceremonies and Super Bowl halftime shows. 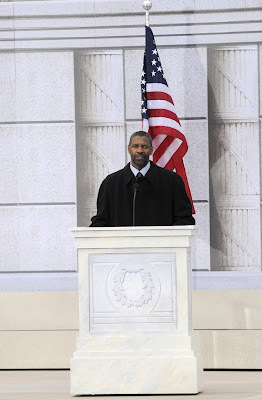 "We will have the statue of Abraham Lincoln looking down on our stage and a crowd of hundreds of thousands of people lining the mall -- a tableau any director would relish." 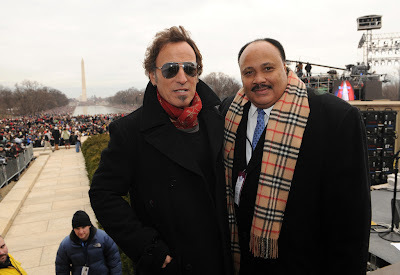 WASHINGTON, D.C. - The Presidential Inaugural Committee (PIC 2009) is pleased to announce the producers and initial talent lineup for WE ARE ONE: THE OBAMA INAUGURAL CELEBRATION AT THE LINCOLN MEMORIAL, the Opening Celebration for the 56th Presidential Inaugural, to be presented exclusively by HBO on Sunday, January 18 (7:00-9:00 p.m. ET/PT). The event will be free and open to the public, kicking off the most open and accessible Inauguration in history. 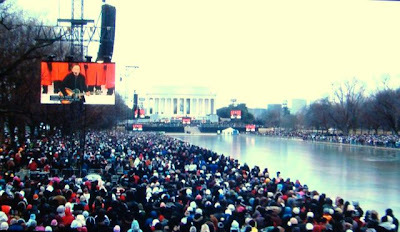 For the latest information on the 2009 Presidential Inauguration, please visit PIC 2009. I missed the telecast last night but was glad that new friends taped the show. Love the look on Eastwood's face when Springsteen jokes about going up against Clint. Good stuff.